Best-selling author Margaret Maron creates entertaining mysteries filled with warm southern charm, colorful down-home characters, and smoldering grudges. In Storm Track, swirling dark clouds of illicit affairs and brutal murder threaten Colleton County, North Carolina. No one worries much about the scantily clad woman found strangled in the Orchid Motel-she must be a tourist who brought along her own problems. But when the victim turns out to be the wife of one of Colleton County's up-and-coming lawyers, the news comes as a thunderclap. People begin looking suspiciously among themselves for the culprit, and Judge Deborah Knott learns her own handsome cousin possesses a mighty powerful motive. While Deborah searches for the vicious killer, a deadly hurricane rages up the Carolina coast, bringing destruction and its own kind of justice. 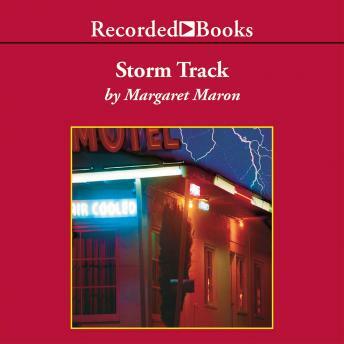 Winner of the Edgar and Agatha Awards, Margaret Maron bases this series on her life in rural North Carolina. Narrator C.J. Critt's lilting performance captures both the crackling wit and the heightening suspense.